NES Donkey Kong, DK Jr., DK 3 & DK Jr. Math in 01:18.39 by Cyorter. 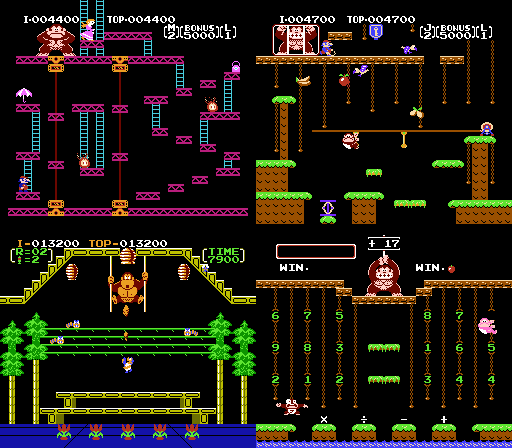 While the NES versions of Donkey Kong, Donkey Kong Jr., Donkey Kong 3 and Donkey Kong Jr. Math don't share the same amount of stages, they appear to be similar enough to be beaten at the same time with the same controller input. This movie improves on the previous movie by playing an additional two games as well as improving by 3.99 seconds. If you like this movie, you may want to check out movies of other games in which as many as four games are played simultaneously with one controller.